The wood and brick fixtures kind of remind me of an Irish Pub, but the vibe I get from the restaurant feels more classy (although I’m not sure if classy is the right word to use). The restaurant seems to be a great fit for friends, family, and even a casual dinner for two;)! What’s great is that the prices are reasonable and they serve up generous portions on every plate! 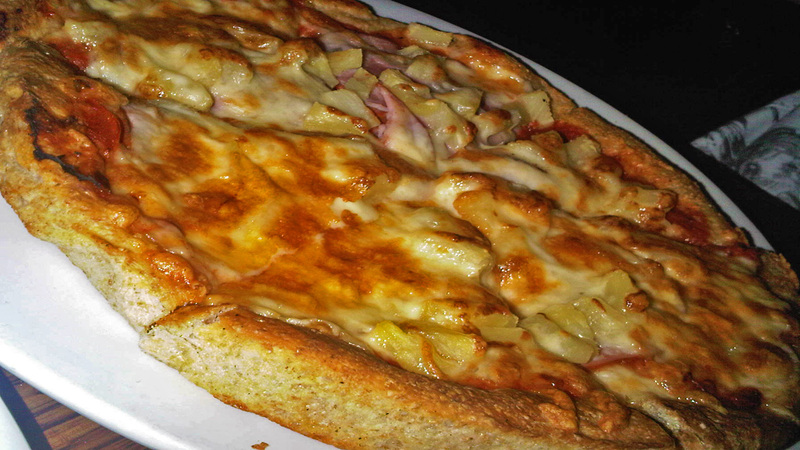 Apparently, they are most well-known for their Whole-Wheat pizzas (one of Vancouver’s first! ), but they have a lot of variety beyond that like Souvlaki, Steaks and Pastas. Just coming here for a chill night with my friend. It was a great place to catch up and to indulge in some savory bites! 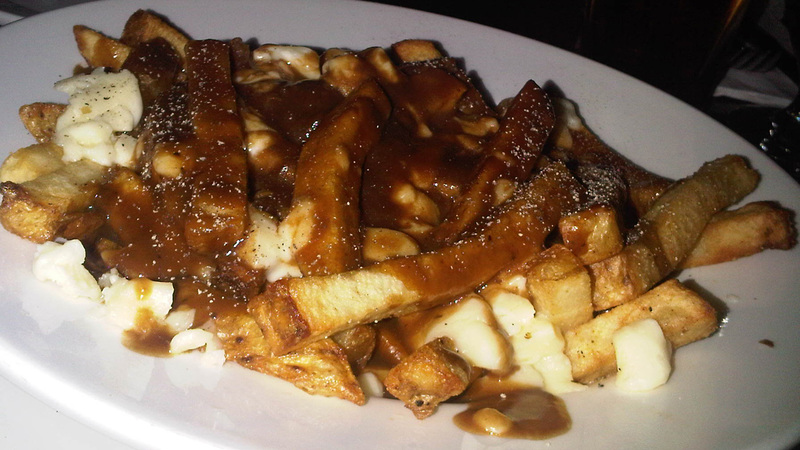 To start, the poutine was a great deal, definitely not the best poutine out there, but it’s definitely a Must Order at Martini’s! The hand-cut french fries are smothered in a thick gravy and cheese. It’s quite a heavy appetizer, but how could you resist? Well of course I ordered a Whole-Wheat Pizza, after all it is a signature item! The pizza was stuffed with loads of toppings, and they offer a lot of combinations but I love Canadian Bacon and Pepperoni. Also, with the handfuls of Pineapple chunks, you get a bit of sweetness biting into the massive slice. But I think the best part of the pizza is the crust; the whole-wheat creates a very crunchy crust and an interesting texture. Definitely not just like another slice from Pizza Hut. My friend said that we had to order this! It was great, although the portions were so massive we didn’t finish it! 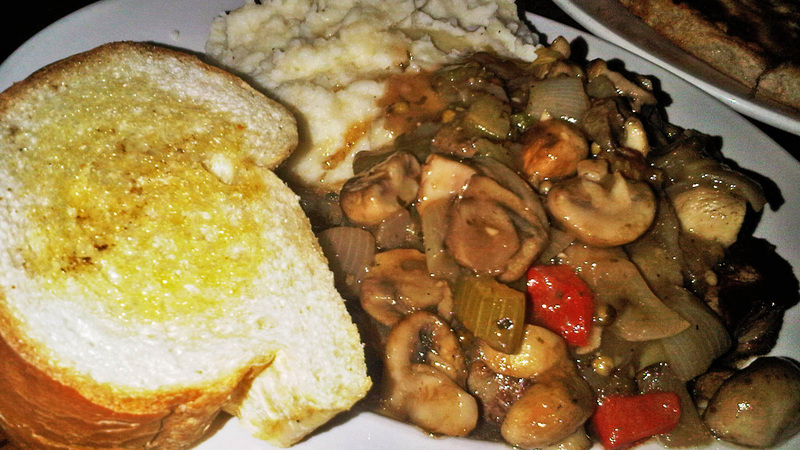 The Mushroom Mixture had a wonderful combination of flavors and went really well with the steak and mash potatoes. I did not expect to eat such a good steak judging from the type of restaurant, but it was cooked to perfection. The mash potatoes were also very creamy and fluffy, with a very buttery flavor. This entree was definitely a full meal! 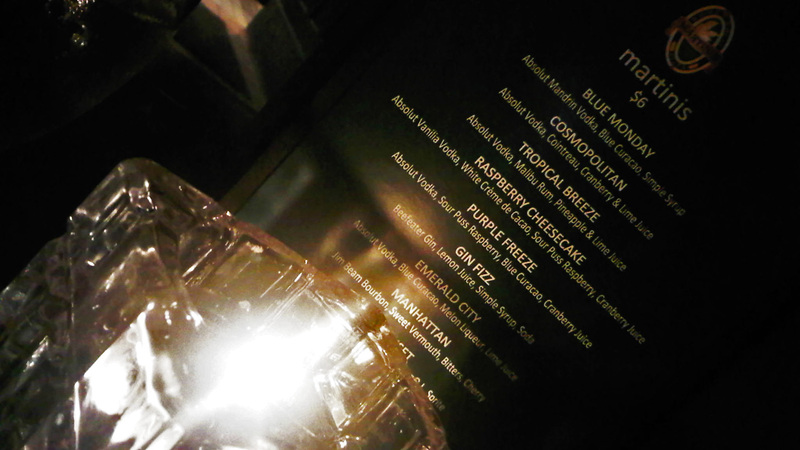 Martini’s was a delightful surprise. I may have expected the usual pub bites, but this was much better! I love the chill atmosphere, and I’d definitely recommend coming here with a group because the portions are huge! But all in all, it’s just a great place with friendly staff and quality cooking for a casual night with friends. But be warned, this place was packed!